An apparent 2 volume sequel to Gargantia. 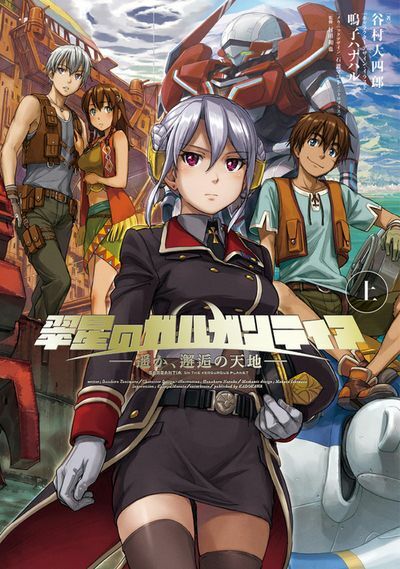 Gargantia on the Verdorous Planet was an anime about a Military Mech pilot who, after warping through a black hole, winds up on an all-ocean no-land foreign planet inhabited by humans like himself (though severely lacking in tech). Seems to have older designs of past characters (some major time passed) and introduces at least one new character (a silver haired lass). The covers are vibrant, the story it's based on is fun (with similarly vibrant characters and animation). Its an interesting set up. In many ways, it's an "Isekai", but instead of moving to a super fantasy world, you're going to a world much more underdeveloped, and introducing your tech brings it's own benefits and problems to that society. And we don't have enough Mecha. Why Would JNC Avoid This? 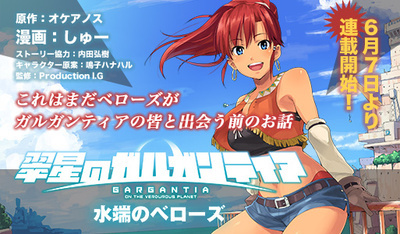 Gargantia is a bit of an older series. I don't know how much people remember Gargantia. Iirc, it was a Gen Urobuchi series, but it's not really in the vein of his previous "UroButcher" mould, so I think it got passed over / some were disappointed about what it was. Also... The author tab on Bookwalker may present trouble. What's this about the author? Yes, there's also a Manga starring Bellows, one of the major side characters and crew of Gargantia. Since Manga is starting in the Fall, good time to launch stuff that is multi media (or if one proves successful, grab the other). So much possibility. Such dreams to be had... and dashed. Famitsu Clear Comics is the label, Kadokawa the pub on the manga. @terrence Yes yes yes yes yes please! This and Gundam novels stand among the things I want most of all to be translated! If anyone wants a synopsis, here's Google trying its best (I won't read the synopsis because I like to go in as blind as possible). You never know (I will make it my goal to request a second UroButcher work and tag it with Gargantia). I should have tagged this with Madoka Magica. Dang, missed opportunity (wait, maybe I'll edit). I need this in my life! Gargantia is one of my favourites and I really wanna see how the story concludes after the Far Beyond The Voyage OVAs. Oh yeah, I would love to read this! Again, love the anime on this one and would love to get the chance to read the LN in English. Especially this because it is a continuation of the story that ended with the anime.